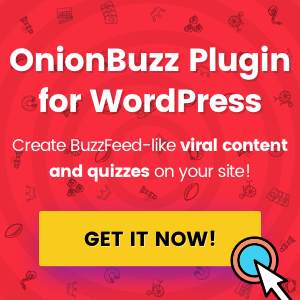 OnionBuzz plugin lets you add beautifully designed and responsive viral content using shortcodes or custom post types. It’s an easy to use and works with any WordPress theme! Place OnionBuzz folder into the …/wp-content/plugins/ directory of your site. Browse for the OnionBuzz.zip file, select it, press Open. Plugin main PHP class is defined in /lib/Core/Plugin.php. It provides standard WordPress plugin routine like settings and appearance presentation in admin and settings storage in WordPress database and also includes other .php files and injects .js, .css on site public pages. Nothing really to customize here, only in case of addition of new functionality . Front-end scripting and third-party plugins are located in main JS file /frontend/js/frontend.js. Please refer to individual articles from right sidebar menu for various guidance. You need to have PHP version 5.3 or higher on you WP server. You need to have jQuery version 1.7 or higher used by your WP installation. Follow First Steps guide and learn how to display OnionBuzz viral content on your website.